With the trapping trade on the decline, mountain man Barnaby Skye takes work as a guide, leading a wealthy Englishman, Graves Duplessis Mercer, and two companions on an exploration of the Yellowstone and Missouri River valleys. Mercer is a peculiar employer. He has come to the American wilderness seeking weird, morbid, thrilling, preferably slightly salacious, material to write up for British tabloids. He has little interest in such amazing natural phenomena as the geysers of the Yellowstone country but is adept in ferreting out stories of cannibalism and similar atrocities. To the Briton's disappointment, Skye has none of these to offer but does agree to take him to a Missouri River valley where gigantic bones of ancient monsters thrust out of canyon walls. Skye's Crow Indian wife, Victoria, warns that the bones are sacred among certain tribes, but Mercer insists on taking a "trophy" – a tooth from a tyrannosaurus-like fossil. This act nearly costs the lives of Mercer's party and its guide, Barnaby Skye. Wheeler's Barnaby Skye, a deserter from the Royal Navy who becomes a legendary mountain man, has been called "the Horatio Hornblower of the Rocky Mountains." At the Publisher's request, this title is being sold without Digital Rights Management Software (DRM) applied. 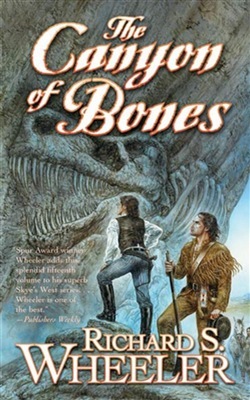 Acquista The Canyon of Bones in Epub: dopo aver letto l’ebook The Canyon of Bones di Richard S. Wheeler ti invitiamo a lasciarci una Recensione qui sotto: sarà utile agli utenti che non abbiano ancora letto questo libro e che vogliano avere delle opinioni altrui. L’opinione su di un libro è molto soggettiva e per questo leggere eventuali recensioni negative non ci dovrà frenare dall’acquisto, anzi dovrà spingerci ad acquistare il libro in fretta per poter dire la nostra ed eventualmente smentire quanto commentato da altri, contribuendo ad arricchire più possibile i commenti e dare sempre più spunti di confronto al pubblico online.